A town of great antiquity is situated at a distance of about 84kms from Amritsar on the GT road going to Kolkata.Jalandhar is known for its sportsmen as well as its sports industry, its steel and iron re rolling mills, rubber goods, electric goods, automobile parts and sewing machine factories and handloom products. Jalandhar is situated between the fertile agricultural land of River Beas and Sutlej and is at a distance of about of 146 km from Chandigarh. Jalandhar played a major role in the forming of history of India. This city in the state of Punjab came into light during the Alexandra the Great who was creating new landmarks in his cherished goal of conquering the world.Jalandhar is not only a part of modern India but it was involved even in ancient and medieval India. It was the cradle of civilization for several dynasties which ruled Punjab. It was under the reign of Mughal dynasties as well under the rule of Sikh confederacies. It took active participation in the independence struggle of India. Baba Sodal Fair - This fair is held in memory of a local child deity Sodal on his death anniversary. 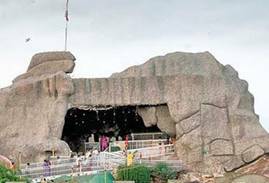 This fair falls in the month of September and the venue is near the Smadh of Baba Sodal where his portrait is adorned with garlands. At the end of the fair offerings are distributed among the pilgrims and they sprinkle a few drops on their body. Harballabh Fair - This is one of the biggest fair held in Jalandhar and it takes place in the month of December. Harballabh Fair is one of the biggest musical fair which involves a music fest of classical music, both vocal and instrumental. Participants as well as viewers come from different parts of the country. The Sangeet Sammelan is held in the premises of Devi Talab one and a half kms. from the Railway Station. This fair is conducted successfully for the past 125 years. Jamma Masjid - This masjid is located in the centre of the city and is nearly 800 year old beautifully designed mausoleum built during the reign of Imam Nasir. Shiv Mandhir - This temple in Jalandhar is known for its Muslim Hindu architecture and is situated near Imam Nasir mausoleum.Shiv Mandhir was built by the Nawab of Sultanpur Lodhi thus dating back to Lodhi Era. This newly renovated temple is located about one km from the railway station. Recently a model of Amaranth Yatra has been built in the premises. The mandie is also adjoined by an old temple of goddess Kali. Sodal Mandir - This mandir is housed by a child deity who is said to be very powerful and this temple is visited by thousands of devotees at the time of 'Anand Chaturdashi' in September. Tulsi Mandir - This mandir is located in the Kot Kishan Chand locality and is dedicated to goddess Vrinda, wife of the demon Jalandhara.Tulsi Mandir is also popularly known as Temple of Vrinda. St Mary's Cathedral Church - This church with its rare cosmo-culture design is a tribute to the Punjabi tradition. This Cathedral at Jalandhar Cantonment, initiated by representatives of His Holiness Pope John Paul II is the only one of its kind in the East. 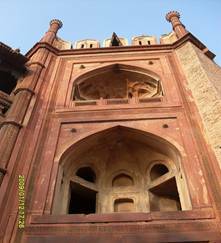 Nakodar is known for 2 beautiful 17th Century Tombs. 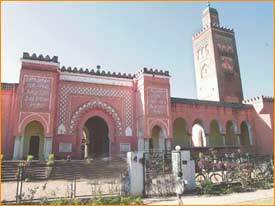 One of these protected monuments, known as the tomb of 'Ustad', the teacher, is of Mohd. Momin Hussain, a musician in the service of Khan-e-Khana during Jahangir's early reign. The second of Hazi Jamal, his pupil, the shagird. This mosque belongs to the Maharaja of Kapurthala namely Jagatjit Singh who built this in 1930 with the assistance of a French architect Manteaux. Lahore and it also resembles that of the great Qutbiya Mosque, at Marakesh in Morocco. 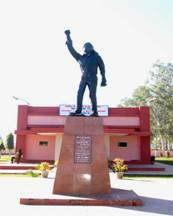 This place is situated in Kapurthala about 21 km from Jalandhar. This mandir is one of the famous monument of Jalandhar located at a distance of about 21 km in a place called Kapurthala.Panch Mandir known for its architecture was built by Fateh Singh Ahluwaliah. This monument situated on the banks of the river Kali Bein is built on an octagonal plan with four gates in cardinal directions. Its drumless squattish dome, broad pointed arches and open arched Jharokas add dignity to its austere design. 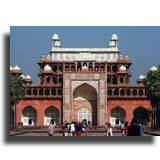 It is situated in a place called as Sultanpur Lodhi at a distance of about 36km from Jalandhar. Gurdwara Chhevin Padshahi is considered to be one of the holy places of the Sikhs for it was visited by the sixth Guru of the Sikhs Guru Hargobind and is situated in Basti Shaikh.This place also houses the handwritten copy of Sri Guru Granth Sahib prepared sometime between 1715 and 1728 by the great Sikh scholar and martyr Baba Deep Singh. This is a small town which houses a Mughal Serai popularly known as Serai Nurmahal, built by Nurjahan, the famous queen of Jahangir. filigree work and tiles of beautiful patterns, topped by 4 delicate minarets. This place is situated at a distance of about 55kms from Jalandhar and it houses the 'Memorial Museum’ dedicated to Shaheed-e-Azam S. Bhagat Singh. The half burnt ashes of Sardar Bhagat Singh, Rajguru and Sukhdev including the blood soaked sand and blood stained newspaper in which their ashes were wrapped are preserved and exhibited here. This place situated at a distance of about 16 kms. from Jalandhar was discovered by the 5th Guru Arjun Dev Ji in 1656 AD.Kartarpur is known for its Gurudwara and the furniture industry.Kartarpur is also known as the birthplace of Swami Virjanand who was the teacher of Swami Dayanand Saraswati, the illustrious founder of the Arya Samaj. This Science city is named after the mother of former Prime Minister of India Shri I.K. 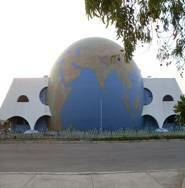 Gujral.This is the second biggest of its kind in the country and is located on Jalandhar-Kapurthala road covering an area of 72 acres.This science city enhances the curiosity of learning through means of fun and amusement for people of all age group. The other attractions of this place includes a 18-foot-high eye-catching model of dinosaur, a GSLV missile and a globe made out of tiny 26 lakh colourful tiles. This is also attached to a children park and a health gallery pertaining to biological concepts.An artificial lake running throughout the science city has been created to give the visitors the pleasure of pedal boating while enjoying the beauty of various marvels of science. 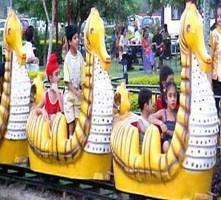 This theme park located at a distance of about 6 kms from Jalandhar spreads over an area of 11 acres is full of water games and water rides. The water rides includes bumper cars, flying jets, horror house, boating, kiddies' boating, play house, flying dragon and a slide splash. The wave pool is another attraction of the water park. There is an aqua dance floor, where boys and girls enjoy dancing on the tunes of the latest Punjabi hit numbers underneath a canopy that has artificial clouds from where the water comes down like a rainfall. The railway terminus at Jalandhar falls in the Delhi-Amritsar Railway Line. This route is mostly traversed by passenger trains and express trains that connect the city to the important cities like Kolkata, Mumbai, Jammu and Nagpur. There is a vast network of bus services to Punjab, Himachal & Delhi, Haryana, Pepsu, Chandigarh, U.P., and Jammu & Kashmir. Apart from the state transports there are also private bus operators. There is no airport in Jalandhar. The nearest airport is Raja Sansi airport in Amritsar, 80 km away which connects to other parts of the country.